but a less expensive installation." 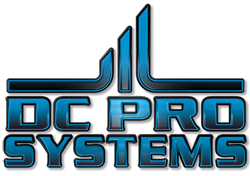 DC Professional Systems, LLC is an Arizona-based low voltage contractor, located in North Phoenix. We are dual-licensed for both commercial and residential work, and have been bonded and insured since 2009. We specialize in the latest technology in security systems, audio/video, automation, and voice/data systems. We package all of these systems together so that we can be your sole provider for low voltage systems. With thousands of successful installations behind us, we are proud to design and offer you a complete customized low voltage system package for your business. After a career of working for some of the largest corporations in low voltage, I found that a small company can provide customers with not only a higher quality product, but a less expensive installation. We will give you superior service and a better one-on-one experience. Sometimes systems installations require decisions on the fly. As a small company, we can make those decisions quickly and accurately, while a bigger company would be lost in red tape. We’ve made careful decisions over the years on product types and local distribution channels to provide redundancy in case a replacement part is needed. We promise to provide you with a superior quality installation, using only the highest quality parts. After the meet and greet, we begin the design process by getting together with you to talk about the available low voltage systems, including time-tested choices and the latest advancements in the field. Once you've made your decision and we've agreed on a custom package, we will produce a detailed proposal that outlines each individual system and its costs. We'll also develop a schedule with you that fits in with your needs. During the installation process, we will keep you informed about our progress. We are especially careful to keep you apprised of any problem situations and how we plan to accommodate them. Once installation is complete, we will provide you with detailed documentation about your low voltage system, including user manuals and device locations. Training is always included for you and your staff. All systems come with a 2-year full workmanship guarantee and a 2-year limited parts warranty. Contact us any time to discuss what systems and services we can provide for your company.